Discover is the OUYA app and game shop. It looks like the homepage of Netflix, only instead of arranging titles by genre, they're in playlists, of sorts. There's a list at the top titled Featured, which we're assuming are titles Ouya is pleased with and looking to promote. Then there are lists of games chosen by developers and media personalities. This android app interacts with the Ouya API's to provide an alternative method of getting the official stores apk files. 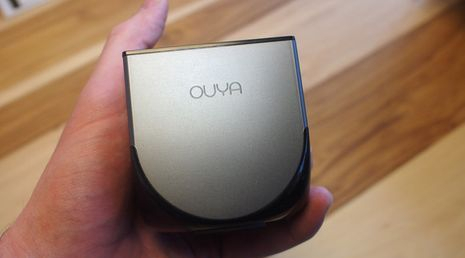 The Ouya is small, only a little bigger than an orange, and would fit easily in the palm of your hand. Not that it's a handheld system, it's your typical console box, meant to look lovely sitting next to your HDTV. And it does look lovely. It's smooth, brushed metal exterior makes it look like an Apple prototype or something jettisoned from the bridge of the Starship Enterprise. Its power button sits on top, lighting up with a white Ouya logo when switched on. 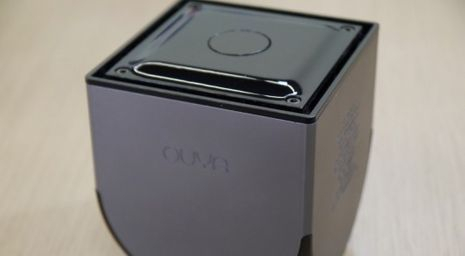 All of the Ouya's ports are hidden in the back, helping it keep its sleek look. It has micro-USB, HDMI, a power port and a full size USB port. The heart of the Ouya is a Tegra 3 processor, the same chip you'd find in a Nexus 7 tablet or an HTC One X+. That's backed by 1GB of RAM and 6GB of internal storage. 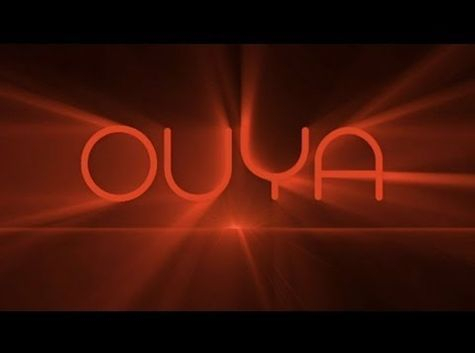 Switch on your Ouya and you'll be greeted with an enthusiastic "Ooh-ya!" That's the Ouya's start screen; the Xbox 360 gives a thrum and a whoosh, the PlayStation 3 tunes up like an orchestra, and the Ouya proudly announces its own name, like a Pokémon entering battle. The Ouya's main menu offers four categories: Play, Discover, Make and Manage. It's pleasingly simplistic, but once you start diving in, annoying design decisions rear their heads.